Mount Carmel burns to the ground at the end of a 51 day standoff between David Koresh, the Branch Davidians and the FBI in Waco. Michael Shannon plays FBI negotiator Gary Noesner, who gets called in to try to bring a peaceful end to the government standoff with David Koresh and the Branch Davidians in Waco. 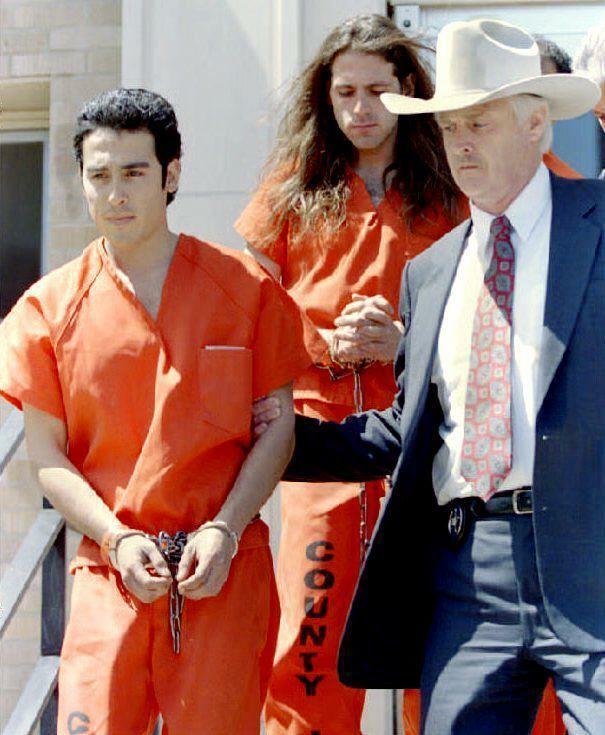 Branch Davidian members Jaime Castillo (L) and David Thibodeau (C) are led from the federal court building after their 1993 arraignment in Waco, TX. The men were two of nine members to survive the blaze that destroyed the Branch Davidian compound. 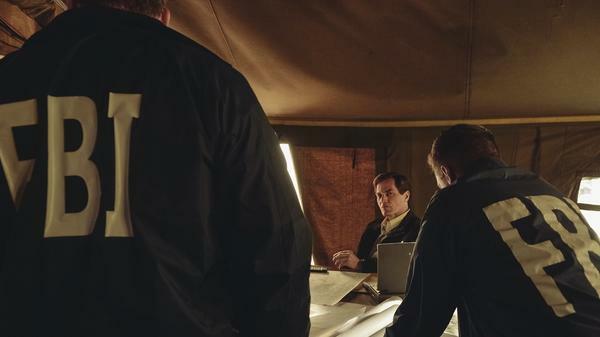 The story is back on our television screens now, this time as a six-part miniseries called Waco. It's largely based on the accounts of two men who were there: Gary Noesner, a retired FBI chief hostage negotiator, and David Thibodeau, one of the few people who survived the siege. Branch Davidian leader David Koresh had a surprising sideline as a rock musician, and Thibodeau says that's what drew him into the group. Thibodeau: Over the course of six months, I got to know the guys, you know, we'd jam a little bit and then sometimes they would come over and give studies. They made it very clear that a big part of their music is about scripture. One of the things that impressed me most was one of the first times I had to study with Steve Schneider, he opened the Scripture. He had one of those quarter inch margin bibles, and every single page was color-coded. The notes were just studious, it was like like an intellectual thing more than just proselytizing to someone, and that really interested me. That's kind of — I always listen to the TV preachers on television and you just see right through them. David wasn't that easy to see through. Noesner: We got 35 people out through the negotiation process, including 21 children. I feel confident that [if] we had done things a bit differently, we could have secured the safe release of a good many more, perhaps everyone. What I like about this TV series so much is they do look at this very complex incident from two perspectives — from inside looking out [and] outside looking in. We always knew that everyone in there was legitimately enthralled and believed in David Koresh's message, and that's why we're there. And it's also one of the reasons that complicated our resolution efforts because David's religious philosophy was that the end times are coming and the forces of evil will come against us. And in essence, the ATF raid validated that prophecy. Thibodeau: But even more so than that ... I believe the negotiators were really trying, there's no doubt about that, is the fact that the tactical commanders would come in and override things that the negotiators would say to us. I won't even say promise, but during the course of conversation, certain things would be said and certain alliances or rapport built. And then the commanders would come in and just destroy all that work that they had done, and made us so much more mistrustful and so much more into, "There's no way out of this. The world is fighting against the last message." And it just — it made it so much truer. Noesner: A bit of a funny story is when we were on set, [had] been there a few days, and we were having lunch, and we ended up being at a table together by ourselves, and David's back was to everyone, so I don't think he saw them, but through my peripheral vision, I'm seeing literally everybody in the crew is transfixed to say, "Are these guys gonna break out in a fist fight or yell at each other?" And we got along fine. There's clearly some areas where we have different perceptions about events. Thibodeau: This is the kind of dialogue that needs to happen more often with American citizens. Everyone should be talking to each other to find out why they have the views that they do instead of just getting on Facebook and yelling at each other. Nobody really, really talks. They don't listen. Thibodeau: I mean, I really just want the people to be humanized in a way. They've honestly just been demonized through the press. There are real children, real mothers, real dynamics going on. It is very complex when there's that many people, and that many people that are focused in the same direction. Honestly it's about them and I want them to be, you know, honored. You know, no matter what you think of David Koresh or the people that died there, they died for what they believed in. And that's more than I can say for a lot of people. Twenty-five years ago, it seemed all eyes were fixed on Waco. WALTER RODGERS: The federal agents came under heavy and sustained fire as they approached a ranch owned by Texas religious cult leader Vernon Howell, also known as David Koresh. CHANG: That's Walter Rodgers reporting for "ABC World News Tonight" on February 28, 1993. That day the Bureau of Alcohol, Tobacco and Firearms attempted to raid a compound owned by a fringe Christian group called the Branch Davidians. The ATF suspected the group was illegally stockpiling weapons. 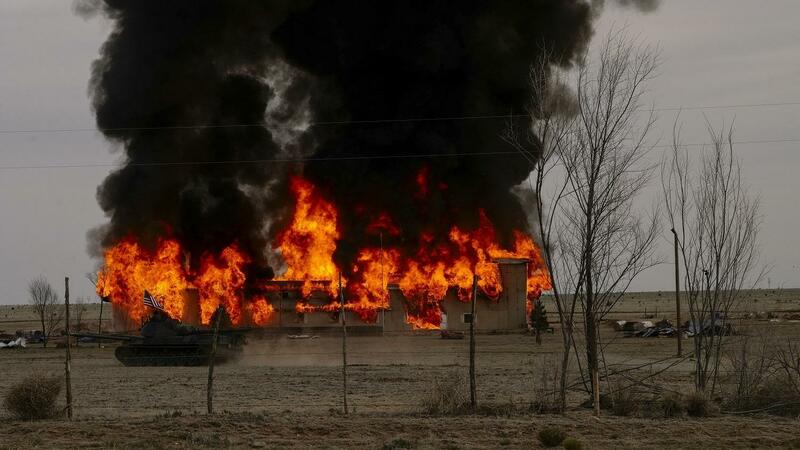 Four agents and six Davidians were killed. And thus began a standoff between the Davidians and federal law enforcement. It lasted 51 days while the nation followed along on TV. And it ended with tanks and tear gas and the compound going up in flames. CHANG: Well, this story is happening again on TV, this time in a six-part miniseries called simply "Waco." It's largely based on the accounts of two men who were there - Gary Noesner, the FBI's chief hostage negotiator, and David Thibodeau, one of the few people inside the compound who made it out alive. Both men recently spoke with our co-host, Kelly McEvers. Thibodeau talked about how he first met David Koresh and his right-hand man, Steve Schneider. They needed a drummer for their band. KELLY MCEVERS, BYLINE: It's one of the many surprising things, I think, about this miniseries, is to learn that David Koresh was, like, in a band and liked to play rock 'n' roll. MCEVERS: How did you end up at the compound? THIBODEAU: Over the course of six months I got to know the guys. You know, we'd jam a little bit, and then sometimes they would come over to give studies. They made it very clear that a big part of their music was about Scripture. One of the things that impressed me most was one of the first times I had a study with Steve Schneider he opened a Scripture and every single page was color-coded. The notes were just studious. It was like an intellectual thing more than just proselytizing to someone. And that really interested me. That's kind of - I always listened to the TV preachers on television and I could just see right through them. David wasn't that easy to see through. MCEVERS: And, Gary, you know, how did federal law enforcement at that time view David Koresh? Like, what was the brief that you were given on David Koresh? GARY NOESNER: I knew nothing about David Koresh until I got the phone call from my boss. It was just that this was a group that, you know, had non-traditional religious beliefs. And some would use the negative term cult. And there had been a shootout. And I was to get to the airport where we kept some FBI planes and fly out there and take over the negotiation process. MCEVERS: You know, I want to talk about what we see in the miniseries, how we see the shootout, that first day, the day of the ATF raid. ATF agents roll in. They're in cattle trailers. They're wearing their tactical gear, carrying a lot of weapons. But the Branch Davidians have been tipped off. And David Koresh, who is played by Taylor Kitsch, at some point comes out of the compound with his hands up. I just want to listen to that scene. TAYLOR KITSCH: (As David Koresh) Please stop. UNIDENTIFIED ACTOR #1: (As character) Keep your hands in the air, and get on the ground now. KITSCH: (As David Koresh) There are women and children in here. UNIDENTIFIED ACTOR #1: (As character) Get on the ground now. UNIDENTIFIED ACTOR #2: (As character) Here we go. UNIDENTIFIED ACTOR #3: (As character) Shots fired. Shots fired. MCEVERS: So, you know, the ATF is shooting. The Davidians are shooting. Koresh is wounded. Agents are wounded. The Davidians later are calling 911, trying to ask for a cease-fire. But still to this day it's unclear who fired the first shot. NOESNER: I think there's a fair amount of controversy. ATF's position is that Koresh was armed and he fired first. And, you know, the folks inside say, no, ATF shot first. I don't really know. And when I go as a negotiator, I don't really care. I mean, that's really not what I'm there to do, is to adjudicate the right or wrong of what occurred. My job is to make sure nothing bad happens after that. And then we can resolve it peacefully. MCEVERS: And you eventually did negotiate to get some children out, yeah? NOESNER: We got 35 people out through the negotiation process, including 21 children. I feel confident that we had done things a bit differently we could have secured the safe release of a good many more, perhaps everyone. NOESNER: We had within - and this is what I like about this TV series so much, is they do look at this very complex incident from two perspectives, from inside looking out, outside looking in. We always knew that everyone in there was legitimately enthralled and believed in David Koresh's message and that's why were there. And it's also one of the reasons that complicated our resolution efforts because David's religious philosophy was that the end times are coming and the forces of evil will come against us. And the - in essence, the ATF raid validated that, you know, prophecy. THIBODEAU: But even more so than that - and I'm glad you brought that up. And this is, you know, no fault of the negotiators. I believe that the negotiators were really trying. There's no doubt about that. It's the fact that the tactical commanders would come in and override things that the negotiators would say to us - I wouldn't even say promise. NOESNER: Sadly, that's quite correct. And one of the frustrating things for us as a negotiation team is when we would reach a point of good cooperation and effect the release of someone, out of frustration and boredom or whatever it was the tactical team would sometimes take some actions on the perimeter that conveyed quite a different signal. A glaring example is the loud music and the loudspeakers that were projected onto the compound. You know, I told command at that time, number one, it's ineffective. It doesn't work. It's against our policy. And I said, at the least it's going to be embarrassing for us. And it was. And yet people to this day say, why did the negotiators do that? Well, we didn't. MCEVERS: You guys met for the first time on the set of this show. THIBODEAU: Yeah. We really didn't run in the same circles before this. That's for sure. THIBODEAU: I could feel it. NOESNER: ...Literally everybody in the crew is transfixed to say, are these guys going to break out in a fist fight or yell at each other? And we got along fine. There's clearly some areas where we have different perceptions about events. There's two perspectives on this. And indeed, this is a complex tragedy. THIBODEAU: It's also - it's the - this is the kind of dialogue that needs to happen more often with American citizens. Everyone should be talking to each other to find out why they have the views that they do instead of just getting on Facebook and yelling at each other or the - nobody really talks. They don't listen. MCEVERS: You know, David, you were one of just nine people who escaped the fire that ended all this on April 19. The bodies of 75 people were recovered from the scene. More than 20 of them were children. And you've lived with this for 25 years. MCEVERS: What do you wish that people understood about Waco that they don't understand? Like, what do you think people just don't get? THIBODEAU: That's - I'm so glad you asked that question. I mean, I really just want the people to be humanized in a way that they've honestly just been demonized through the press. There were real children, real mothers, real dynamics going on. It is very complex when there's that many people and that many people that are focused in the same direction. Honestly, it's about them. And I want them to be, you know, honored. You know, no matter what you think of David Koresh or the people that died there, they died for what they believed in. And that's more than I can say for, you know, lot of people. MCEVERS: Well, David Thibodeau, the man who was on the inside, and Gary Noesner, the man who was on the outside, thanks to both of you. KELLY: The TV miniseries "Waco" premieres tomorrow night on the Paramount Network. (SOUNDBITE OF GOAT RODEO'S "HELPING HAND") Transcript provided by NPR, Copyright NPR.